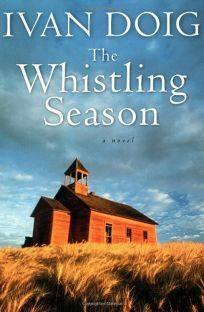 Like many of Doig's earlier novels, The Whistling Season is set in the past in rural eastern Montana—and addresses that time and place in distinct, uncluttered prose that carries the full enthusiasm of affection and even love—for the landscape, the characters, and the events of the story—without being sentimental or elegiac. The novel is narrated by an aging Montana state superintendent of schools, Paul Milliron, who is charged with deciding the fate of the state's last scattered rural schools, and who, in the hours preceding his meeting to determine those schools' fate, recalls the autumn of 1909, when he was 13 and attending his own one-room school in Marias Coulee. Recently widowed, Paul's father, overwhelmed by the child-rearing duties presented by his three sons, in addition to his challenging farming duties, hires a housekeeper, sight unseen, from a newspaper ad. The housekeeper, Rose, proclaims that she "can't cook but doesn't bite." She turns out to be a beguiling character, and she brings with her a surprise guest—her brother, the scholarly Morris, who, though one of the most bookish characters in recent times, also carries brass knuckles and—not to give away too much plot—somehow knows how to use them. The schoolteacher in Marias Coulee runs away to get married, leaving Morris to step up and take over her job. The verve and inspiration that he, an utter novice to the West, to children and to teaching children, brings to the task is told brilliantly and passionately, and is the core of the book's narrative, with its themes of all the different ways of knowing and learning, at any age. Rick Bass is the Pushcart and O. Henry award-winning author of more than 20 fiction and nonfiction books. His second novel, The Diezmo, will be published in June.